Two long-term experiments (11 years) showed the intriguing ability of G. senegalensis and P. reticulatum (optimized at ~1000 to 1500 shrubs ha-1 with residue returned to soil) to dramatically increase yields of groundnut and millet, with or without fertilizer additions and maintain yields in drought years. Experiments were carried out from 2013-2016 with pearl millet in northern Senegal, where G. senegalensis dominates, in the presence or absence of the shrub and fertilizer rate (0, 0.5, 1 or 1.5 times the recommended N-P-K rate). The presence of shrubs reduced from 7-10 days the developmental phases of crops than the no shrub plots (P< 0.05) for all years. This early growth resulted in greater plant height, biomass and yield of crops, which in part can be attributed to improved soil water availability. Under drought conditions, shrubs contributed to reduced water deficit on associated crops. Shrubs significantly increase particulate organic matter, which is positively correlated with crop yield. Particulate organic matter (POM) are small fractions of the soil made up of decomposed detritus, plant material, pollen, and other materials. It is the source of soil fertility and the most limiting management factor. The POM increases the soils ability to hold water and creates a better rooting environment for crops. 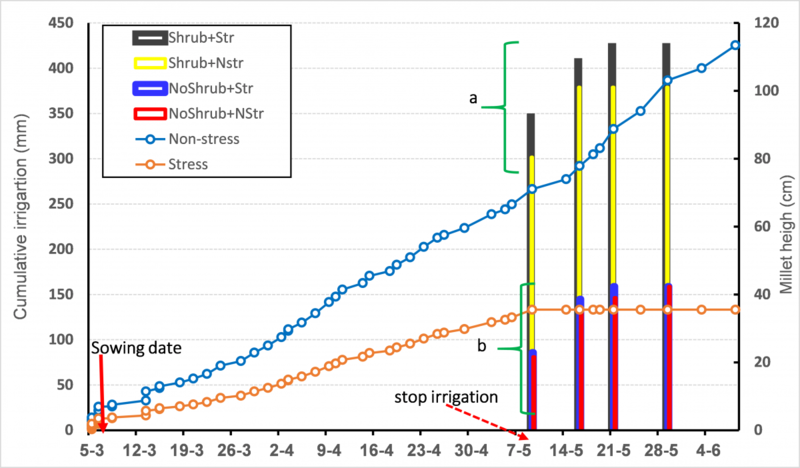 The Figure below shows the striking relationship of increased particulate organic matter from the shrubs resulting in a corresponding increase in yield.